Rothberg International School at The Hebrew University of Jerusalem | AndiSites Inc.
At Rothberg International School (RIS) students enjoy studying at an elite institution with a global reputation, expert faculty, advanced facilities, and extensive networks. Diverse program options serve students’ unique goals and interests. The location in Jerusalem provides the excitement of a unique city while immersing students from all over the world in a challenging and supportive academic adventure. RIS needed a website that would reflect its dynamic, exciting personality and provide easily found comprehensive information. 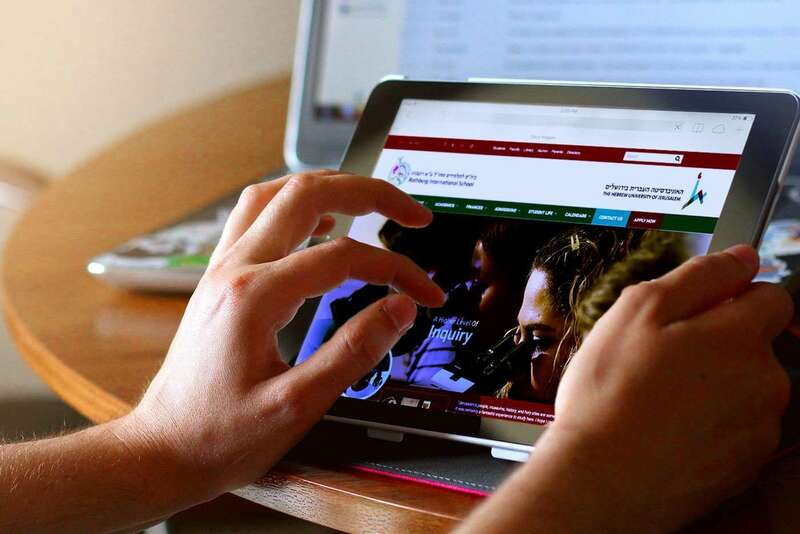 They needed an easy-to-use Content Management System to update information quickly. And they needed design flexibility that let them create customized page layouts when they needed them. RIS also had many proprietary custom-built systems (e.g., student logins, online payment portals, course directories) that had to be seamlessly integrated into the new website while continuing to reside on their respective servers. This project included collaboration with an external content firm and coordination of teams across time zones from Colorado to Jerusalem. RIS engaged AndiSites to create a colorful, vibrant new mobile-friendly website design that showcased their offerings and helped make important content easy to find. We developed the new RIS website in the intuitive, scalable WordPress content management system. We designed and developed multiple selectable page templates (right sidebar, left sidebar, full-width, etc. ), and we implemented a drag-and-drop page builder to create unique layouts for landing pages and other custom content. 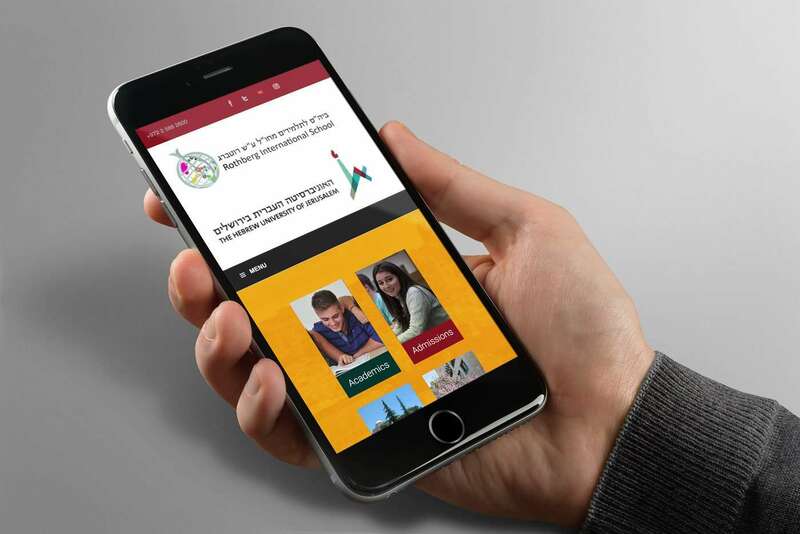 AndiSites integrated external applications into the new website seamlessly and worked with Hebrew University’s IT department to ensure that nothing broke upon launch. In addition to the website project, AndiSites created online and print versions of a new style guide for RIS. We also designed and implemented MailChimp email newsletter templates that reflect the new website design and branding. Thank you for all of the attention and the good work that you and your team put into our new website. It is exactly what I hoped for – colorful, engaging and friendly. The real test was when I was running from place to place and had to field a call on my cell asking for dates and prices of a particular program. I literally went into the site as a new user, found the information quickly and easily, and was able to provide the information necessary. Names of interested students are starting to accumulate from visits to the "contact" page. Our Board of Directors was very favorably impressed when we presented the site to them. A major supporter just communicated their praise for the new site. Everything is running smoothly. We are also able to make additions and changes as the requests come in from the various departments. 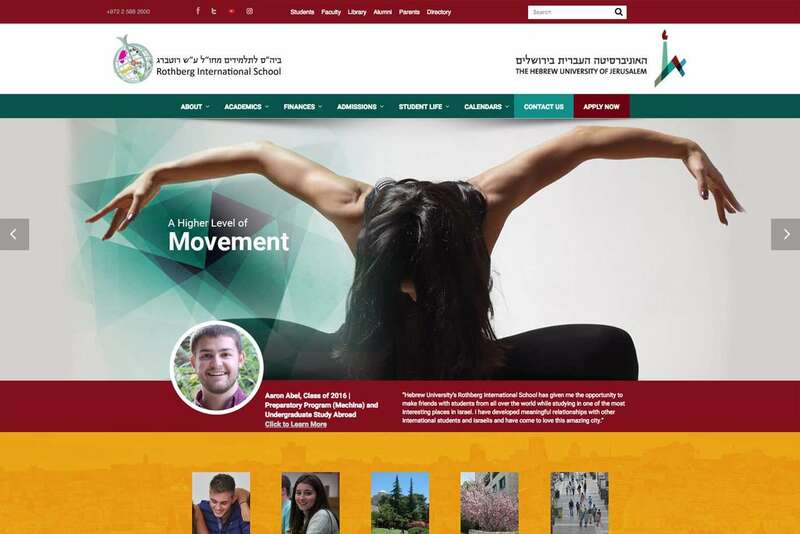 Rothberg International School now has an award-winning website that immediately engages users with striking photography, big blocks of color, bold typography, and geometric accents. Site visitors use the megamenus, dynamic sitemap, and robust search feature to quickly find comprehensive, multi-layered content items. Site administrators have the tools and training to update website content often, and RIS now uses their website successfully as a primary marketing tool for recruitment. 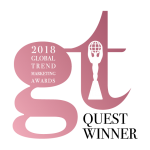 Importantly, mobile website users, who comprise 40% of all users of this site according to recent analytics, are able to fully enjoy the site from their phones and tablets.